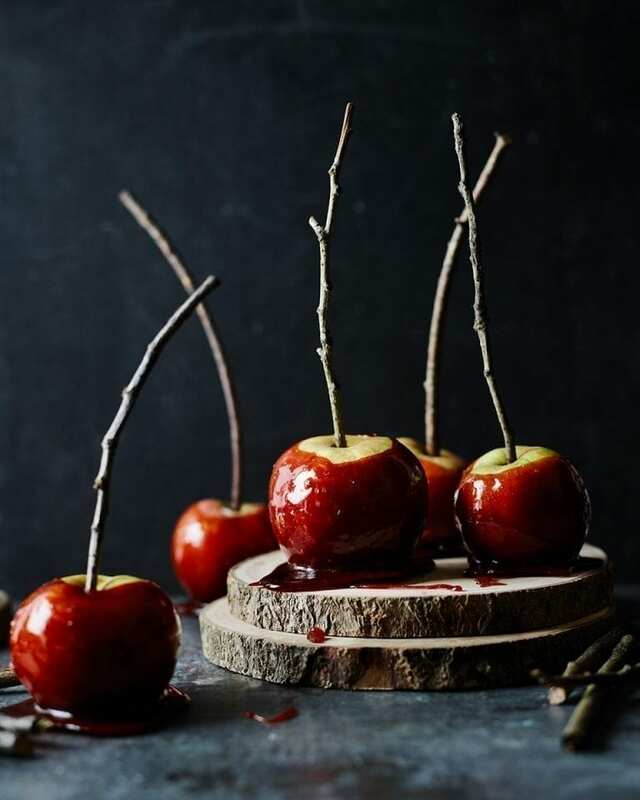 Toffee apples are the ultimate Halloween or Bonfire Night treat. Simple, but effective, they’re perfect for children and adults alike. Put the sugar, vinegar, butter, syrup and 150ml cold water in a pan over low heat and stir until the sugar has dissolved, then turn up the heat to medium and boil until the mixture turns a deep golden colour (or until a sugar thermometer or digital probe reaches 140°C). Using a fork, quickly swirl in some of the red gel food colouring and edible glitter. Insert a stick into the middle of each apple, then dip into the toffee, turning several times to coat fully, then sit on the tray lined with baking paper to set for around 30 minutes. These will keep for a couple of days.